The planet Uranus is the seventh out from the Sun. With a diameter of 31,400 miles, it is the third largest of all the planets in the solar system. It lies an impressive 1,787,485,510 miles out from the Sun - that's getting on for one thousand million miles further out than the solar system's sixth planet, Saturn. One orbit of the Sun takes just over 84 years and the planet rotates once every 17 hours and 14 minutes. As you can see from this image, photographed in 1986 by the NASA probe, Voyager 2, the planet Uranus appears to be a featureless light blue sphere. This is due to the planet being cloaked in a haze of hydrocarbons. However, the planet does actually present some features when examined more closely and we'll be considering these further down the page. One unusual thing about Uranus is that its axis is tilted around 90 degrees, meaning that, every 42 years, one of its poles is almost pointing directly at the Sun. Halfway between these two occasions, the equator of the planet is aligned with the centre of the solar system, with the planet "on its side", so to speak. Since its discovery, in 1781, by Sir William Herschel (although he initially thought it was a comet), Uranus's atmosphere has proved very difficult to analyse. In more recent decades, various probes have managed remote sensing to some 190 miles through the various atmospheric cloud layers. It is now known that the atmosphere of Uranus consists of three sections. This is the outermost layer of the atmosphere, beginning at an altitude of around 3,000 miles and extending as far as 31,000 miles into space. It consists mainly of hydrogen molecules and free hydrogen atoms. It displays an average temperature of 825 degrees Kelvin. The reason for this high value is unknown for certain. Beginning at an altitude of 620 miles and 2,500 miles thick, this is Uranus's middle atmospheric layer. It receives heat both from the thermosphere and the effect of ultraviolet absorption by the methane that is present. This hydrocarbon filters through from Uranus's innermost atmospheric layer. As well as hydrogen and methane, the stratosphere contains ethane, carbons monoxide and dioxide and water vapour. In the area of this layer nearer to the planet, more complex hydrocarbons are present, such as methylacetylene and diacetylene. At low altitudes, the temperature of the stratosphere cools considerably, causing these hydrocarbons to condense, forming the haze that cloaks the planet. 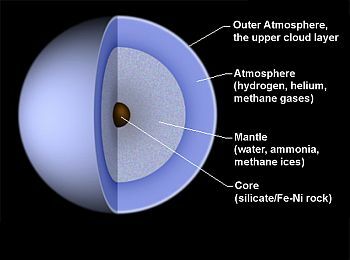 The bottom layer of Uranus's atmosphere, this is, by far, the densest area - and the coldest. It also contains all the planet's climatic features. There are strong winds, white methane clouds and dark spots. It has been postulated that the troposphere may display, as well as methane clouds, several other different types. Clouds made from water, ammonium hydrosuphide, ammonia and hydrogen sulphide have all been suggested, but, so far, only methane ones have been directly observed. Compared to the other three planets in the outer solar system, Uranus's climate is very calm, benign and uneventful. This is thought to be because the planet doesn't generate anything like as much internal heat as the others, another fact that sets Uranus apart. The reason for this lack of internal heat is not known, but it accounts for Uranus being the coldest planet in the solar system. 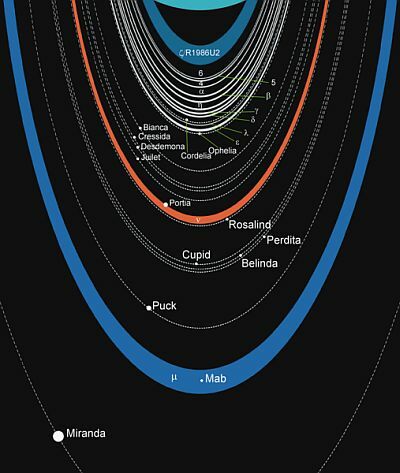 Because of the unique axial tilt of the planet, it is very difficult for space probes (or telescopes, for that matter) to observe the whole of Uranus's surface. As it takes around 84 years to orbit the Sun, the northern hemisphere, say, would be the only part of the planet that could be seen for twenty-odd years. As was shown in the top image on this page, the planet Uranus originally presented as a featureless blue ball. However, successive years of observation have revealed a major feature in the southern hemisphere - a bright polar cap surrounded by a prominent white band, designated a "collar". Here we see the "collar" quite clearly. Taken in 2005 by the Hubble Space Telescope, you can also see Uranus's rings and a white methane cloud in the northern hemisphere. Through the limited observation possible by Voyager, it seems that these features intensify as that particular polar area faces the Sun. In other words, as the northern hemisphere eventually points at the Sun at the other side of Uranus's orbit, the southern cap and collar will have faded away, to be replaced by a similar feature in the northern hemisphere. As has been mentioned, the above image shows a relatively small cloud. Voyager has observed a grand total of 10 clouds. Further, more recent observations have shown that northern hemisphere clouds are smaller and brighter than their southern hemisphere counterparts. Some clouds can come and go in a matter of hours while others can last for decades. In 2006, the Hubble Space Telescope discovered a dark spot on the planet. 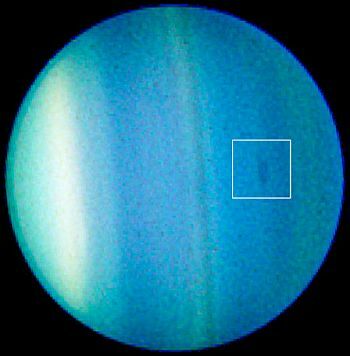 These spots are common on Uranus's "twin", Neptune, but this was the first time such a feature had been seen on this planet. Further observations showed that the spot had a lifetime of at least two months. It was thought to be caused by a thinning of Uranus's methane layer. The planet also displays a number of bright spots, which are probably thunderstorms. Keeping track of the planet's cloud movements shows that winds can exist of up to 560 miles per hour, but their speed is very much dependent on their latitude. Because of its unique axial tilt, the planet Uranus has seasons unlike any other planet. Each pole experiences a 42-year "night", followed by "day" of similar length. They represent the planet's winter and summer solstices. During the spring and autumn equinoxes, when the equator is facing the Sun, days and nights are pretty much the same as any other planet. Even though the planet Uranus, along with the other three in the outer solar system, is classified as a "gas giant", its interior is mostly comprised of ice. The same is true of its twin, Neptune, which has led some astronomers to reclassify them as "ice giants". As you can see from the above graphic, it is thought that there is a small rocky core comprised of silicate rock, iron and nickel. The mantle is entirely comprised of different types of ices, covered by the substantial atmosphere discussed above. The existence of a ring system around the planet Uranus was first observed in 1977. As they are very faint, it took until 2005 for a total of 13 rings to be catalogued. Their names are hardly inspiring, being either numbers or letters of the Greek alphabet. This is the closest ring to Uranus, beginning only about 7,500 miles from its surface. One of the two "dusty rings" it has been observed sporadically, in 1986 and again in 2003. It appears to have two inward extensions and a total width of 10,500 miles. These are the narrowest and dimmest of all the rings. With widths, respectively, of 1.37, 3 and 2.73 miles, they are very difficult to observe. It is known, however, that they are inclined slightly out of the planet's equatorial plane. These rings are Uranus's brightest, after the Epsilon Ring. However, their width and brightness varies on a regular basis. Their average thicknesses are, respectively, 4.5 and 5.5 miles. This ring is in two sections, a thin optically bright area and a much wider and dimmer one. The two sections have widths, respectively, of 1.6 and 25 miles. This is a bright, narrow ring of only 2.9 miles width. Devoid of dust, it is very thin, so much so that, sometimes, it appears to vanish. Like Eta Ring, this one is in two components - a narrow bright section of 3.7 miles width and a broader dark one 7.5 miles wide. The ring has a wave-like structure, likely caused by the presence of a tiny moon. This is the second "dusty" ring, along with Zeta. It is very dark and narrow, only being up to 1.25 miles wide. It is "shepherded" by the moon Cordelia, which creates a dark band within it. This is the densest and brightest of all Uranus's rings, accounting for over 60% of the total light reflected from them. Its width varies considerably, from 12.25 to 60 miles. The ring is very thin estimated at around 500 feet. It has two "shepherd moons" - Cordelia on its inside and Ophelia on its outside. These are the two "outer rings" of the system, discovered only in the first decade of the 21st century. In contrast to all the other rings, these two are very wide. The Nu Ring spans 2,361 miles, with the Mu Ring covering 10,563. Both probably consist of dust particles. Nu is slightly red in colour, while Mu displays a bluish tint, indicating the presence of water ice within it. The planet Uranus has 27 confirmed moons. They can be divided into three groups. The inner moons are 13 in number and are all intimately connected with the planet's rings. There are nine "irregular" moons lying far out from the planet and, finally, Uranus's five main moons, Miranda, Ariel, Umbriel, Titania and Oberon. These five important moons have their own pages on this site, so we'll just be considering the other two groups here. Cordelia is the closest moon to Uranus. It acts as a "shepherd moon" to the Epsilon Ring, orbiting just inside it, at 31,000 miles out from the planet. 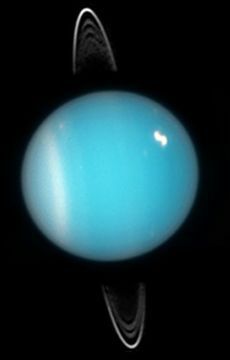 It is 25 miles in diameter and orbits Uranus in about eight hours. Next out is Ophelia, shepherding the Epsilon Ring from its outer edge. It lies 33,423 miles out, is nearly 27 miles in diameter and orbits in around nine hours. Then we come to Bianca. It lies 36,766 miles out and is nearly 32 miles in diameter. It orbits the planet Uranus in about 10.5 hours. Fourth moon out is Cressida. It is 38,388 miles out from Uranus, which it orbits in just over 11 hours. Its diameter is 50 miles. At nearly 39,000 miles out, we come to Desdemona. With a diameter of 40 miles, it orbits Uranus in 11.5 hours. Next is the biggest moon so far. Juliet is 58.4 miles in diameter and orbits Uranus at a distance of around 40,000 miles, in just under 12 hours. However, this is dwarfed by the next one. Portia is second largest of the inner moons. It lies 41,000 miles out, orbits in nearly 12.5 hours and is around 84 miles in diameter. We're halfway through these inner moons! Next, there is Rosalind, another moon of small dimensions, only 45 miles across. It sits 43,459 miles out from Uranus, which it orbits in 13.4 hours. Next is the tiny moon Cupid. At a mere 11 miles across, it orbits in just under 14 hours at a distance of 46,478 miles. Only four more to go! The first of these is Belinda, with a diameter of 56 miles, orbiting 46,764 miles out in about 15 hours. Then, the small moon, Perdita. At 18.64 miles across, it orbits in 15.31 hours at a distance from the planet Uranus of 47,473 miles. The penultimate of the inner moons is the most important in the group. Puck is an impressive 100 miles across and orbits at a distance of 53,444 miles in 18.28 hours. Finally, we come to the most recently discovered of the inner moons. Mab is quite tiny, at 15.5 miles across. It lies 60707 miles out and orbits in just over 22 hours. This group of nine moons lies way further out from the planet Uranus. All except one have retrograde orbits. Most of them are really tiny and were probably objects captured by Uranus's gravity soon after its formation. They are also considerably spaced out. The group begins with Francisco, 2,656,983 miles out. At only 13.67 miles across it takes 266.56 days to orbit its host planet. Moving to 4,492,513 miles out from Uranus, we arrive at Caliban. It is 44.74 miles across and orbits in 579.5 days. Then, at a distance of 4,972,212 miles, there is Stephano, with a modest diameter of just under 20 miles. It orbits Uranus in 676.5 days. Next we come to the tiniest moon of this group. Trinculo is only 11 miles across and, at a distance of 5,325,772 miles, orbits in 758.1 days. After the smallest, we come to the group's largest moon - Syncorax. 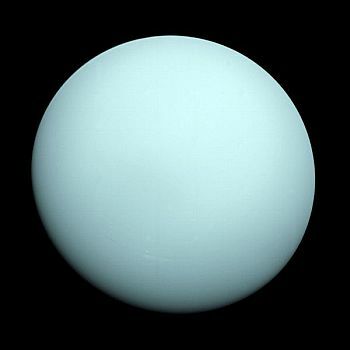 It lies 7,567,679 miles out, is 93.2 miles across and takes 1,283.4 days to orbit Uranus. Now we come to the one moon in this group that, for some reason, doesn't have a retrograde orbit. Margaret is 8,913,569 miles away from Uranus, which it orbits in 1,694.8 days. It is 12.43 miles across. Finally, the remaining three, Prospero, 31 miles across, at 10,201,672 miles, Setebos, 30 miles across, at 10,848,520 miles and Ferdinand, 12.5 miles across, at an impressive 12,986,657 miles. They orbit in 1,992.8, 2,202.3 and 2,823.4 days respectively.